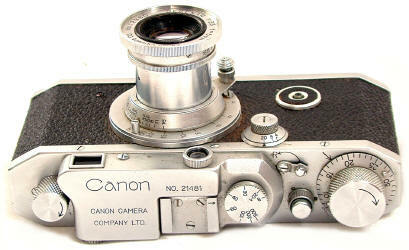 One of Canon's many "Leica Copies," the Canon S-11 of 1946-1949 has some interesting Canon 1sts. With a production of over 7,500 cameras, the S-II was Canon's largest production camera to date, a sure sign things were looking up for the small company. 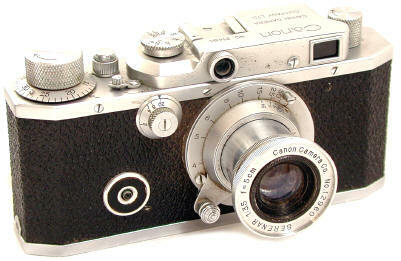 Later S-11's like this one were the first Canons to have a standard Leica thread mount and the first Canon products to be marked "Canon Camera Company." Earlier S-11's were marked "Seiki-Kogaku" and may have had the earlier J mount or even an experimental mount. This sample shows some light corrosion, something typical for early Canon cameras -- the chrome finish was not that good. This example also has a flash sync outlet on the front. All S-11's left the factory without sync. This conversion was so well done, however, I can't help wondering if it was a later factory conversion. Yes indeed, the 50/3.5 Serenar is a close copy of the Leica Elmar 50/3.5. .
Controls and operation were typical Leica screw mount. The S-II's differed from their Leica heritage, however, by having a combined rangefinder-viewfinder instead of separate windows for each. All S-II's were marked "MADE IN OCCUPIED JAPAN" on the baseplate. If your S-II does not have it, somewhere it lost it's original baseplate. The Canon S-II is important as a reminder of Canon's past and future: the occupation of Japan after W.W.II by American troops, and a proud young company first using the moniker for which it would become world famous "Canon Camera Company."